BTS’ recent Billboard chart accomplishments are sparking attention more than ever; the curious and trend-seekers will be flocking to BTS’ most recent music videos. But will they stick around for BTS later? If the top Youtube comments under BTS videos are meme-filled, arguments, boyfriend fantasies or rants about BTS’ looks, it will turn away potential new listeners or worse, dismiss BTS as artists. 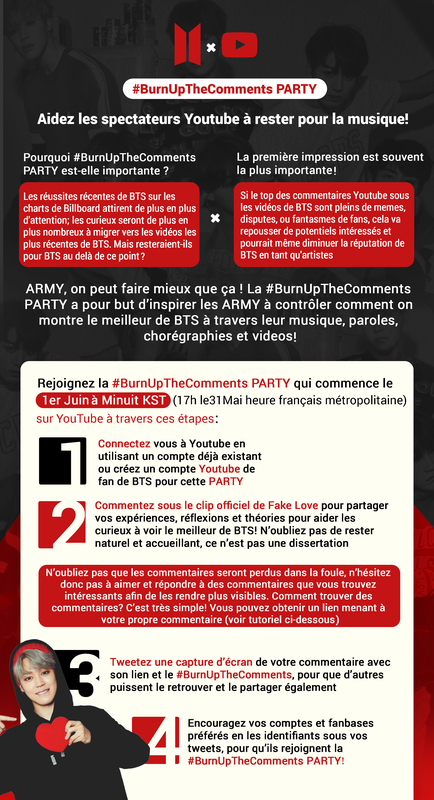 This project has the objective of encouraging ARMYs to write constructive and helpful comments under BTS’ music videos to show the world why BTS are such great artists. The first step to giving BTS better comments on their Youtube page is acknowledging what unproductive comments are. It is great that you want to share your enthusiasm and love to the boys and the rest of the world, but making comments like “his abs just punched me in the face and sent me flying into outer space” or “J-Hope can use his harness on me anytime”, while funny, are not useful or thoughtful compared to all the hard work BTS has done over the years. We want to create a better image of BTS Army because we are tired of the general public’s views on us and I know you are too. We all know, and BTS knows, that we are more than “obsessed fans” and we want to prove it. The more insightful and thoughtful comments appear on their youtube page, the better chance we have of controlling our narrative and giving our boys a better opportunity to be recognized as artists. Theories – Post your own interpretations or borrow any theory available on the internet. Note: If the theory can be traced back to a single army, do source them. 3. Anecdotal – Post a meaningful experience or memory that the song or video brings to mind for you. 5. 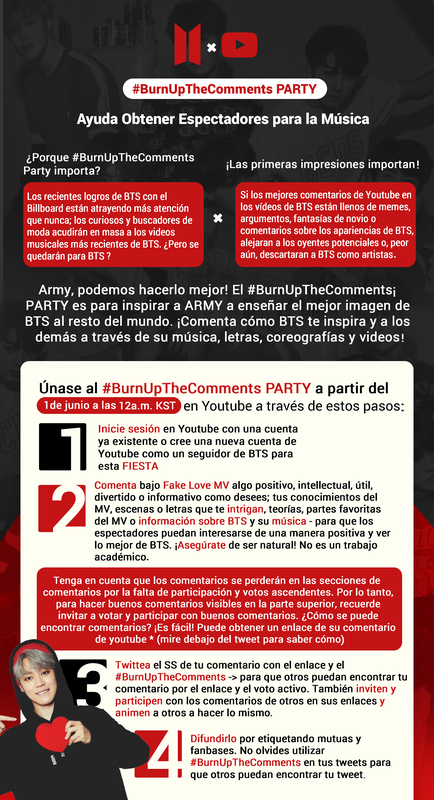 Talk about BTS – Write a few words on BTS music or who they are; mini introduction, their roles in the group, their stories, etc etc. 6. Lyrics – Talk about the lyrics and post the translation in your choice of language. Note: Make sure you credit the translator if you are using someone else’s translations. Not confident in your writing abilities or not sure where to start? Is there a line in [insert song] that resonates with you? Who were you most excited to see/hear in the song? Did they meet your expectations? Fake Love talks about hiding your true self to please others, have you ever done the same and why? What are the best places to listen to [insert song]? How would you describe your version of a fake love? How did you feel the first time you listened to [insert song]? Is there a symbol BTS use in their music/lyrics/videos that you particularly love? What meaning does it have to you? Is there a detail that struck you when re-watching that you hadn’t noticed at first? What is your interpretation of this detail? What part/scene of the video is your favorite? Why? How has BTS’ ‘Love Myself, Love Yourself’ message affected you? In what way do you think it is incorporated into the lyrics to [insert song]? Have you shared this song or video with friends/family? What were their thoughts? Briefly write an introduction to BTS and their Music to General Public to help them know about BTS. If you can be creative without resorting into stereotyping/memeing them then we’d have a higher chance of GP remembering them. What do you think about fashion in Fake Love MV? Does it say anything about the storyline? Would you wear that kind of clothes? Does vocal and rap line mix well together? Share your thoughts on that topic. What part of the choreography made you rewind with amazement? What is your favorite part of the choreography? BTS’ lyrics moved a lot of people. Do you feel powerful after listening to their songs? Listening to “Fake Love” and “DNA”, how are these two title songs similar? How do they differ? Do you think “Fake Love” accurately portrays the dark side of Love? Listening to “Fake Love”, what do you think is worse, lying to yourself or lying to others? Describe how you felt the first time you heard BTS’s music. How did you discover them? What do you think about the music video now that you know there was no computer graphics used? French and Spanish translated posters.